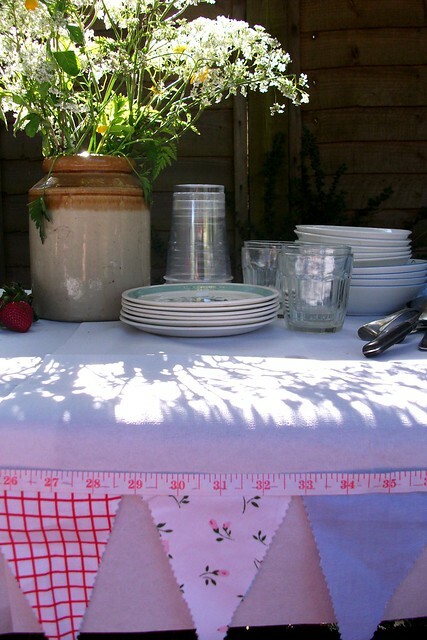 This Saturday I went to a friends summery tea party. It was actually a little gathering of friends and neighbours for her daughters 17th birthday. It was good medicine to be out in the summer sun and socialize for a few hours. ......and I might of had to overcome my I just can't socialize feeling like this persona in order to go!......I decided not to think about too hard and just went. Thankfully I did. In fact, I'm sure it was me who was getting rather excited about the wonderful egg and cress sandwiches and exclaiming loudly all about it. I had never tasted better!......apparently it's all down the seasoning and the cress......I can tell you going to the gym prior eating said sandwiches also helps!! In fact I think I ate nearly all of them. Hope that doesn't mean I will be forgotten to be invited next time! I was also rather excited about this lady's red and white gingham sundress, sadly that's not me wearing it! I was so ready to believe it was handmade! Very suitable attire for a tea party don't you think? We ooed and aahed over the handmade bunting. Sewn on to a measuring tape from a christmas cracker no less! very clever! 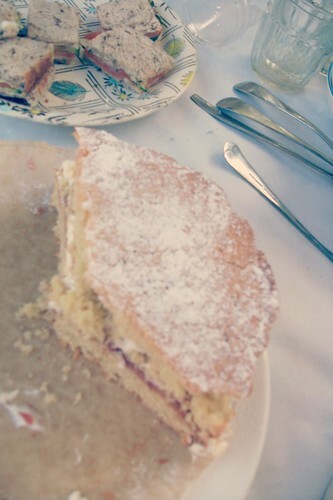 We admired the vintage teapots and drank copious amounts of tea and ate delicious victoria sponge cake and meringues and cream. Oh and gorgeous ripe strawberries too. I was a very well fed and happy guest. Feeling virtuous by way of having gone to the gym first! It's only once a week, but it keeps everything moving and the endorphins are good. I also managed to score a summery top on the way there, which I wore. By using my thrifting skills! Which helped, oh and I wore my vintage sunglasses, so all was good. Back at home we kicked off shoes and relaxed on the swing seat. By we I mean me and my little dog of course! 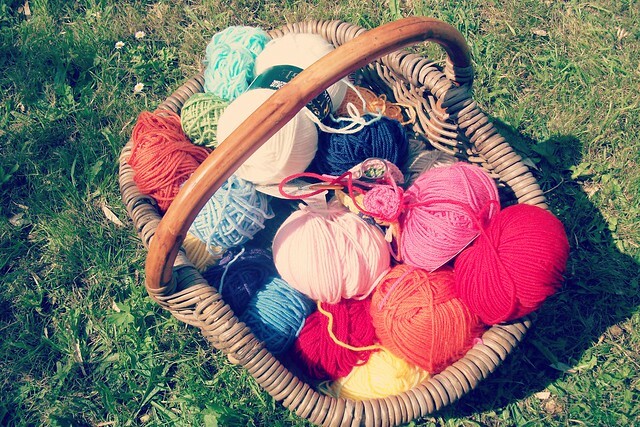 Accompanied by the wool basket. I loved working with the bright colours in the sunshine. Another cushion is being made, I'll show you soon. This is our sweet spot this summer, lots of time going to be spent here! Thank you for your support and advice on my last post. I was thinking it would be good to join a parents of teenagers support group, if there is such a thing! it only takes a few wise words from others and you can get a glimmer of hope again going again. So thank you lovely people. Have a good week. Got to go now and mow a meadow! Hi Heather, So glad you had a good time OUT!! !Sometimes an outing like that is as good as a holiday!!! 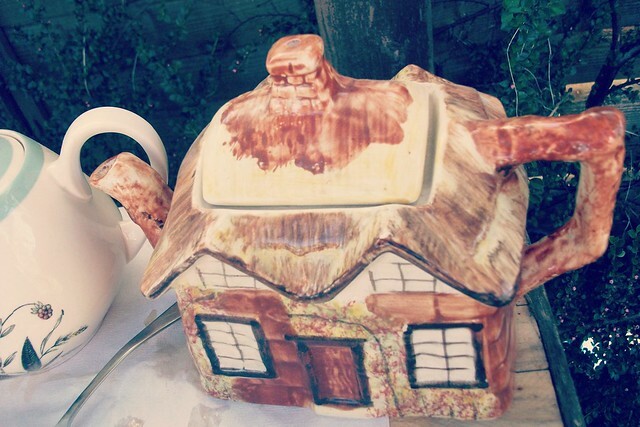 Maybe you should organize your own little tea or garden party!! !Oh my word!! !Are you really going to mow a meadow?!! Hope you have a happy sun filled week!!! No it's my little joke, but it is a big garden. One half has been left to grow high and will need strimming soon and I try and mow the other half before it gets too long! What a lovely garden party! yes and notice how she gets the pillow! The gingham dress is gorgeous - I do love red gingham - and it looks like you had the perfect weather for it. Very Summer like. Summer has come and gone here. 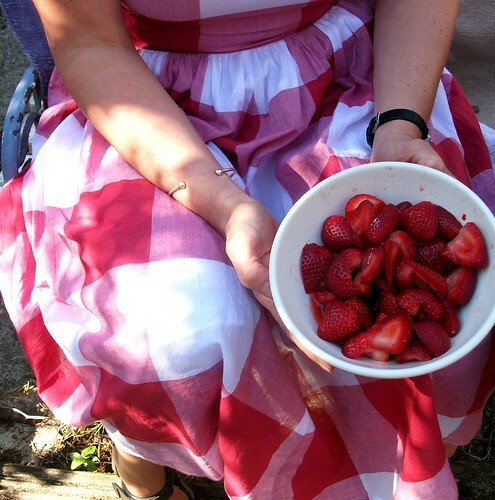 I'm so glad you went to the party and had such a good time Heather - such pastimes can be so uplifting: a change of scenery and company, good food - and I love that lady's gorgeous dress, it makes the perfect picture complete with the dish of strawberries on her lap! Your little dog is adorable and what good company! Looking forward to seeing your 'crocheted in the sun' cushion. Keep on having happy times and don't work too hard on that grass clipping! We can have a lot of fun when we get past limiting beliefs about ourselves. ;-) Looks like you had a great day! Ooooh I want a gingham sundress too, now!!!!!!! How beautiful it is!! Hi have just visited your flicker page. What lovely, colourful wonderfulness. It made me smile. As does that dress :)) Glad to see you having a good time. 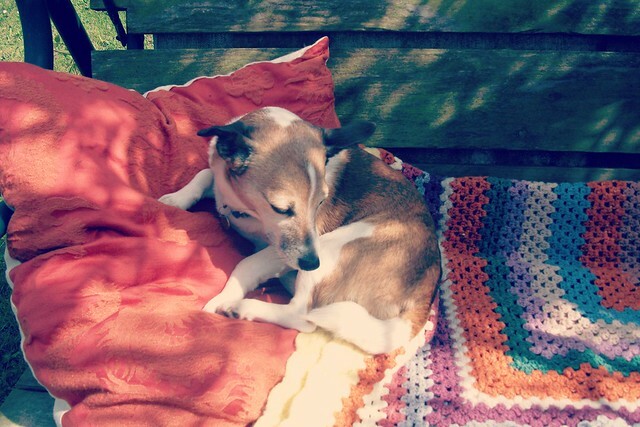 Little Dog is having a nice life too as is my LD .. they love sunbathing don't they? These pictures look so wonderfully summery - it's so cold here again this week :( I was just getting used to the weather being warmer, and daring to venture into my summer clothes! Love that red dress btw! I agree with Em above! Your pictures are just so beautiful and capture the essence of early summer perfectly. It looks like a lovely party and great weather too!